Great family pastimes await your enjoyment in Midwest City! We have family-friendly activities and offer many one-of-a-kind special events throughout the year. American Girl Live is a stage production featuring original songs and unforgettable experiences. Come along to sleepover camp with some new friends for an exciting summer away from home. As bold tales of bravery and friendship come to life, iconic American Girl characters lend a hand through story and song. Join your favorite American Girl characters and the campers as they follow their hearts, share their dreams and learn the power of friendship. Click here for more information and tickets. Cruise in for Coffee occurs on the third Saturday of every month from April to October. Enjoy free coffee while you browse the amazing vehicles that participate in the car show. Car and motorcycle enthusiasts of all ages love this free event! Join us for a fun evening of food, friends and community. Restaurants from Midwest City and surrounding areas offer tastes of their fabulous food during this fundraiser. There will be music, drinks, a silent auction, wine pull, great food and more! All proceeds benefit the Midwest City nonprofit community. Tickets are $20 and can be purchased here. 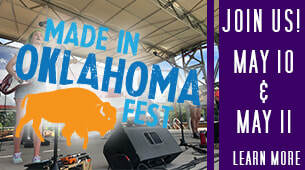 Friday, 5 - 9 p.m.
Saturday, 10 a.m. - 9 p.m.
Made in Oklahoma Fest is now a two-day festival! This year there will be a concert on Friday night, and tickets will available to purchase soon. There will also be an Oklahoma artists gallery and kids' fun zone, so everyone can join in on the fun! The festival includes local Oklahoma vendors, wineries, breweries food trucks, live bands, classes, contests and more! Click here for more details. Bring your friends and family for some fun in the sun and kick off the season by the pool! The Star Spangled Salute Air and Space Show at Tinker AFB is one of the largest air show events in the southwest and the largest in the state of Oklahoma. Tinker AFB is pleased to present the US Navy Blue Angels Jet Demonstration Team and F-16 Demo and USAF Wings of Blue Parachute Team. In addition to the Blue Angels, Tinker will present numerous civilian and military aircraft, war bird planes and modern warfare technology in one of the most thrilling air show presentations to date with a series of tributes to WWI, WWII and the Vietnam conflict. This vent will bring summer fun for the whole family! Click here for more information. Come out and join us for Family Fridays: Rhythm and Flicks! This summer concert and movie series is sure to have something for the whole family with great live entertainment, bounce houses, yard games, food trucks and a movie under the stars! Join us for the 16th Annual Tinker Inter-Tribal Council Pow-Wow as we honor our veteran warriors. This free family event is open to the public and will include a variety of ceremonies, dancers and contests. Bring chair and blankets and spend the day with us on June 8! Click here for more information. Bring your flip flops and beach balls for this much-needed Mommy/Son time! This event is a pool party for boys ages 3 to 14 to enjoy with their moms and mother figures. It will include games, music and more! Tickets are $8 and will include a hot dog, chips and a drink. Click here for more information. 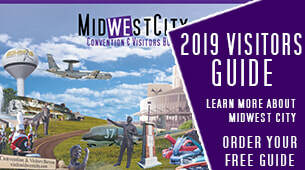 This year's Buick Club of America National Meet and Car Show will be in Midwest City this year! You must be a club member to register a car into the show, but it is free to be a spectator. This show will bring members from all around the world to Midwest City, so make plans to attend this big car show! Click here for more information. Five years after his last comedy tour, Force Majeure, Eddie is back to his roots with an all-new show which expands on his own very unique, totally surreal view of life, love, history and his 'theory of the universe.' Click here for tickets and more information. The City of Midwest City is proud to present Tribute to Liberty, an annual family-centered patriotic celebration featuring musical performances, food trucks and a fireworks display. Click here for more information. Spend an evening at the pool with your furry friend! Each dog will be $6 and owners get in for free. There is a limit to only 2 dogs per owner. All dogs must be on a leash when out of the water and up to date on their shots. Click here for more information.